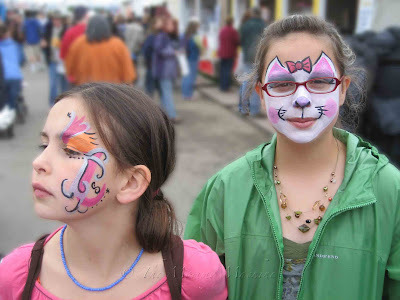 Each year at the Alaska State Fair, I've allowed my older girls to choose between painted faces or crazy hair. 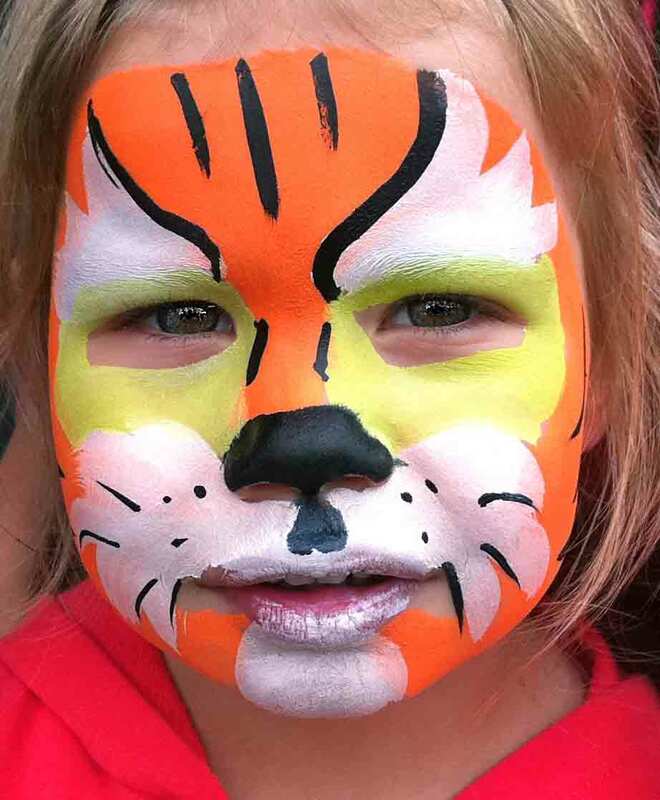 This time around, they both decided to go for face paint. Now that the twins are 4 years old, I let them go ahead and join in the fun, and they were thrilled to participate for the first time in their sisters' annual tradition. I figured my excited babies would want beautiful sparkly butterflies like all the other little girls. As usual, I thought wrong. With daughters like these, it's a good thing I don't have boys. Wow, those are certainly some choices your twins made. Does that paint get itchy or flaky? The twins felt itchy right after it was applied, but they were scratching VERY carefully because they didn't want to ruin their look(! ), then it was okay for the rest of the day. It didn't flake off, although the white on the lips came off immediately. Allisons is my favorite, but they all look so cute! The fair is one of the things I really wish we could have gotten to see, glad you guys made it and had a good time. By the way, where's your face paint?? Kids really do love face paint! They must feel they are completely transformed. How fun! Such a cool dragon! We've never ventured into the full face paint. I can't imagine it not getting smeared all over. Mainly on my pants when she comes and rubs little face on my leg. Those are really cool designs and I love the bright colors! My girls for whatever odd reasons don't want their faces painted! Go figure! Sweetums had never gone for face painting. 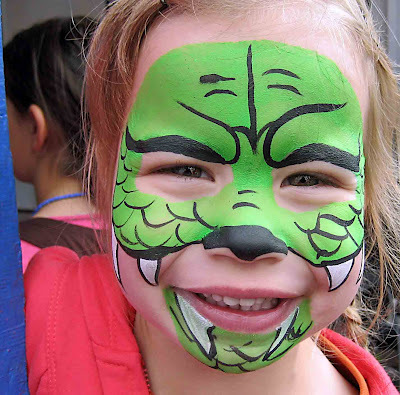 This summer, she did allow a frog to be painted... On her hand!